Karl Lagerfeld's "Designer of the Year "cosmetics collection for Sephora are in, and they have the designer's stamp all over them - literally. An eyeshadow palette features five Karl-shaped shades, whilst make-up bags are emblazoned with black and white photographs of the designer. 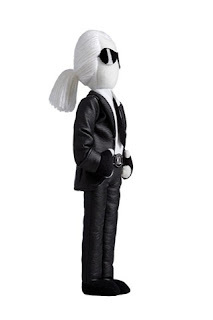 Comprising nail polishes, eye shadows and accessories, the line will also include a Karl Lagerfeld doll - complete with sunglasses and white ponytail, of course - and a snow globe in which his silhouette stands surrounded by golden flakes.